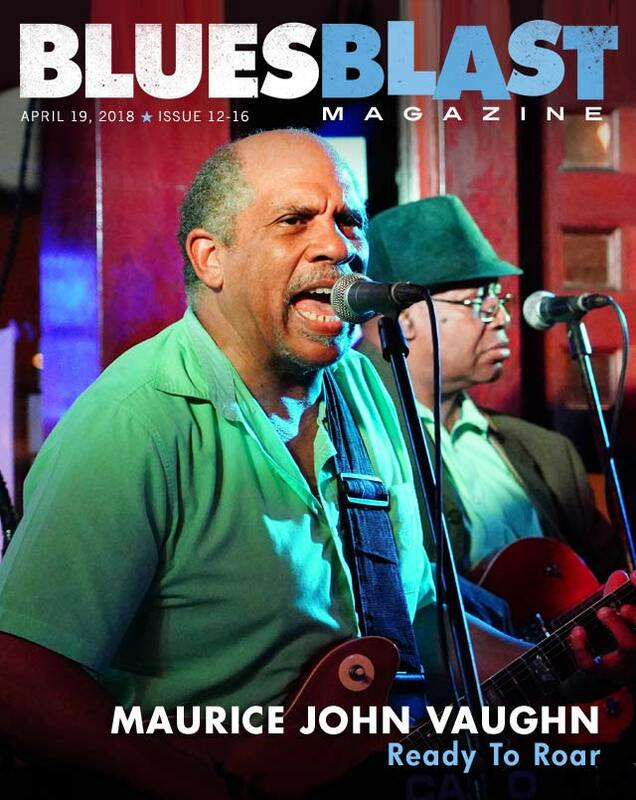 At a time when a great many contemporary blues artists crank out a new CD every year or two to sell from the bandstand between sets, it’s been a lot longer than that since Chicago multi-instrumentalist Maurice John Vaughn has had a full-length piece of fresh product out under his own name. Way back in 2001, Toledo, Ohio-based Blue Suit Records released Vaughn’s most recent album, Dangerous Road. That just doesn’t make sense, considering how solid that album and the ones he’d previously put together for Alligator and his own Reecy imprint were. 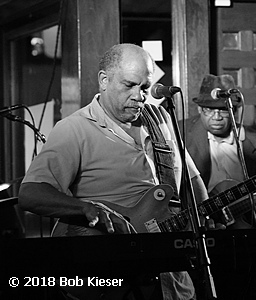 They showcased a versatile artist equally conversant in traditionally rooted Chicago blues and modern, soul-inflected material, a true triple threat on guitar, saxophone, and vocals. Now Vaughn plans to take matters into his own hands—and not just in the recording studio. 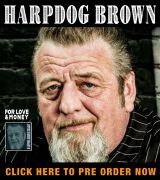 He’s about to make the leap into the booking business, not just to supplement the engagements his agent gets him, but to work with singer Joseph Morganfield, youngest son of the legendary Muddy Waters, and Freddie Dixon, Willie Dixon’s bass-playing offspring and a founder of the Original Chicago Blues All Stars. They’re planning a trip to California for a June festival appearance with Big Bill Morganfield, and if things go right, a lot more than that. Good things have been happening for Vaughn. On February 26, the Original Chicago Blues All Stars (Dixon, drummer Jimmy Tillman, and guitarist John Watkins are their nucleus) honored Maurice at their Blue Monday International Blues Gala award ceremony at Chicago’s Harold Washington Cultural Center. 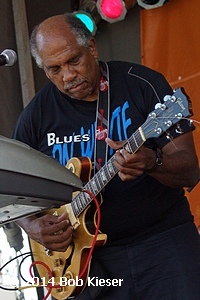 He just returned from playing the Maintenance Shop in Ames, Iowa, where Maurice’s troupe included three sons of mighty Windy City blues legends: Morganfield, Dixon, and drummer Tim Taylor, whose late father was guitarist Eddie Taylor. Vaughn has his own trip to Brazil slated for next month. “I played in Brazil twice, once with the Original Chicago Blues All Stars and once they brought me over by myself out to play,” he reports. 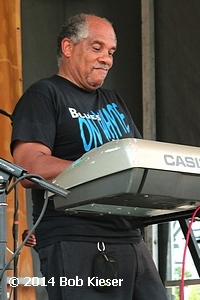 Maurice also plans to tour Florida and South Carolina for four weeks in July with singer Donald Ray Johnson, the former drummer for the popular disco band A Taste of Honey, who now performs blues. 2018 marks Vaughn’s golden anniversary as a professional musician. “This is 50 years for me in the business performing,” he marvels. “I was just thinking about that the other day—in December of ‘68, I had my first gig!” Back then, a teen-aged Vaughn was strictly playing R&B with a youthful outfit called the Gents of Soul. Born and raised on Chicago’s South Side, Maurice was attending Juliette G. Low Upper Grade Center when he caught the musical bug. Maurice was with the Chosen Few long enough to play on their 45 for Chuck Sibit’s Mod-Art label (headquartered at 10358 S. Forest Avenue on Chicago’s South Side) pairing “Cut Me In” and “We Are The Chosen Few.” All eight members were credited with writing both sides. “They just put everybody’s name down there,” he says. “Everybody contributed something. I was working with the horn players. That’s why I did the horn arrangements.” After Maurice left, the Chosen Few played with Windy City soul great Walter Jackson. Even though he focused solely on sax with the Gents of Soul and then the Chosen Few, Maurice began learning his way around a guitar as early as 1971. “I couldn’t find enough work playing saxophone. I was wanting to start seriously playing guitar, because I was playing for a couple of singing groups,” he says. “I wasn’t trying to write back then, but I was trying to figure out how these songs went, and all the chords and everything. I was a little frustrated waiting on other guitar players to write everything, and I started playing one. As the decade progressed, Vaughn drifted a bit closer to the genre that he’s now known worldwide for. “I actually was playing some blues, because we played blues when I was playing with this group, Greg Donald and the Rhythmers. They had one guy that did all blues all the time. His name was Si Perry. He was part of the revue,” says Maurice. “We had a female vocalist, Emma Francis. She sang all Aretha Franklin kind of stuff. We had a guy, he would come up and do sort of Johnnie Taylor-type stuff. 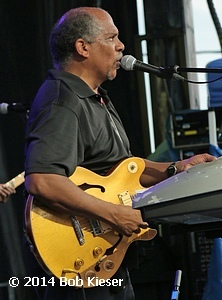 Maurice made his full-fledged blues conversion in November of 1979, although he’d been playing behind veteran soul-blues vocalist Lee Shot Williams. “We’d go out every now and then, do some gigs with him in Mansfield, Ohio. That’s where his manager lived,” he says. “We also carried Melvina Allen out that way.” But it was while Vaughn was playing at a joint at 23rd and South Cottage Grove that harpist Little Mack Simmons was involved with that opportunity came knocking. “I was playing with Professor and the Love Finders–Professor Eddie Lusk, the keyboard player,” he says. “We were playing a gig down there, and then Phil Guy came in and sat in with us. He told Professor that he needed a group to play. He had five weeks of gigs in Canada. ‘Heck, yeah, we want to go for five weeks!’ So we went with Phil.” Vaughn played on the guitarist’s 1982 JSP album The Red Hot Blues of Phil Guy. “I was supposed to play guitar and sax, and I ended up just playing saxophone on ‘Garbage Man Blues’ and things like that because they did the session while I was out of town,” says Vaughn. “There was nothing left to add but the horns, so I ended up putting the saxophone on there.” Maurice also appeared on Phil’s encore set with big brother Buddy for JSP the next year, Bad Luck Boy. A.C. Reed hired Maurice in ‘84 for a lengthier stint. “I really liked playing with A.C.,” Vaughn says. “He was a lot of fun to work with. I didn’t get a chance to play my saxophone as much, because I played guitar all the time with him because he played saxophone.” In addition to hitting the road with the droll saxman (his first gig with him was four nights in Albuquerque), Maurice played guitar on Reed’s 1987 Alligator album I’m in the Wrong Business!. “I also did some horn parts on that album that I didn’t really get credit for,” he notes. Before that, A.C. and Maurice cut a 1985 LP together for the French Blue Phoenix logo, I Got Money. There was plenty of studio activity for Vaughn during the ‘80s. He backed dynamic drummer Casey Jones on his Solid Blue set for Rooster Blues, played on and produced Zora Young’s debut album Stumbling Blocks and Stepping Stones, and helmed a single on his own Reecy label by boisterous piano man Detroit Junior. 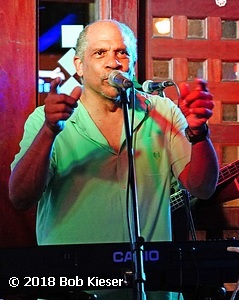 Reecy was the original home to Vaughn’s own 1984 debut album, Generic Blues Album. 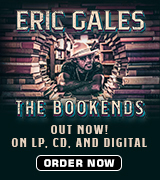 Its profoundly stark artwork—black print on a white background, no liner notes or photos—was a matter of necessity. “It was mainly the cost, because I asked the (printer) how much for the black-and-white album, and how much for the color album. The color album was like three or four times as much as the black-and-white album. I said, ‘Well, I’ll have the black-and-white album!’ Now I have to have something catchy, so that’s why I came up with the Generic Blues Album,” says Vaughn. Alligator released Vaughn’s encore set, In The Shadow of the City, in 1993. “That CD was a compromise of kind of what I wanted and what Bruce wanted to put together there too,” says Maurice, who tackled pianist Jimmy Walker’s romping “Small Town Baby” on the disc. “That was one of the first tunes that we recorded,” he says. “It took a long time to do that, but I was so happy when we were able to do ‘Small Town Baby,’ do one of Jimmy Walker’s songs, because I was working with him at the time. I think he was about 90 when he recorded with me.” Another standout selection, “I Want To Be Your Spy,” was chosen to grace The Alligator Records 25th Anniversary Collection, winning Vaughn more new fans. “They might not know about my whole CD, but they know about that one song,” he notes.